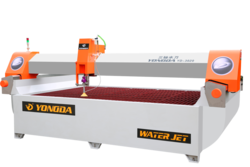 Leading Manufacturer of water jet cutting machine, bridge cnc water jet cutting machine, flying arm cnc water jet cutting machine, yongda water jet cutting machine and 5 axis water jet cutting machine from Ahmedabad. We are the leading organization actively engaged in offering superlative quality Water Jet Cutting Machine. Broadly used during fabrication of machines parts, the given range of cutting machine is examined on numerous parameters in order to make certain the quality before the final dispatch. Our offered cutting machine is highly demanded and applauded by our customers as it is designed keeping in mind the varied demands of our customers. The offered cutting machine is provided in the market at competitive price. We are offering Bridge CNC Water Jet Cutting Machine to our client. 50 HP High-Pressure Supercharger with 450 MPa pressure for smooth finish cutting at high speed. The main heart of Supercharger, "Intensifier" is "Made in the USA". User-friendly & minimum maintenance cutting head design with the USA the make "Water Switch Seal Kit" & other parts. All parts of a machine are processed on Highly accurate Mazak 5-axis machining center (made in Japan). Which gives you trouble-free operation & long life of parts. 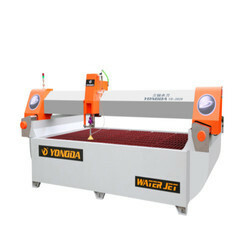 We are offering Flying Arm CNC Water Jet Cutting Machine to our client. User-friendly & minimum maintenance cutting head design with the USA makes "Water Switch Seal Kit" & other parts. 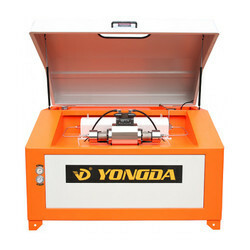 Keeping track of latest market development we are actively engaged in offering Yongda Water Jet Cutting Machine. Widely used for cutting soft & hard materials, the offered jet cutting machine is in good demand in the market for its high performance. In order to assure the quality, the complete range of jet cutting machine is checked on numerous parameters before the final delivery at the customer's end. 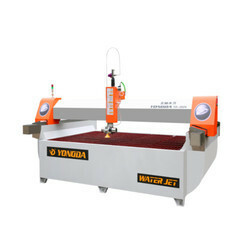 The offered jet cutting machine is provided with different specifications at the affordable price. We are offering 5 Axis Water Jet Cutting Machine to our client.